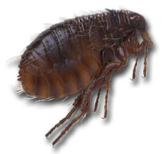 BMS Pest Control offers a fast, effective and professional service at affordable prices to rid your home of fleas. Our treatments are safe, clean and are carried out at a time that is convenient to you. We will be happy to answer any questions you may have and to offer help and advice. Call us now on 01202 710635 (Poole) or 02380 371866 (Southampton) for a free, no obligation quotation. Alternatively, you can fill out the form below and we will contact you. Please ensure that any pets have been treated with a ‘Spot On’ insecticide such as ‘Frontline’ or ‘Advantage’. We ask that you remove as much clutter from the floors as possible. It is also beneficial to thoroughly vacuum the property before a treatment - this will remove eggs (please dispose of vacuum bags afterwards) and the vibrations will help flush out the fleas that are hiding in the cracks and crevices. We will treat all carpets, skirtings and soft furnishings with a residual insecticide containing a chemical called bendiocarb. Unlike DIY aerosol sprays or ‘flea bombs’, a residual insecticide will continue to kill fleas even after the treated surfaces are dry. This is applied as a coarse spray using a pump sprayer. We do not spray clothing or bedding. We ask that customers vacate the premises during treatment and not return until the carpets are dry. Once dry, it is 100% safe for the occupants to return, including children and animals. After treatment we will provide you with a written treatment report and an information sheet giving advice on how to maximise the effectiveness of the treatment.